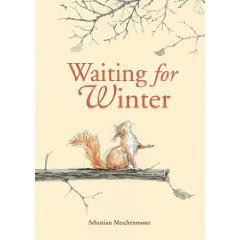 Waiting for Winter by Sebastian Meschenmoser. Kane/Miller. 2009. Copy supplied by publisher. ALSC Notable Children's Book. The Plot: Deer casually mentions to Squirrel, "winter is almost here. I think it's going to snow." Squirrel decides to stay up during winter to see snow; soon he involves Hedgehog and Bear in his vigil. But they've never seen snow; they just know its "white and wet and cold and soft." The Good: Will the animals stay up long enough to see snow? Or will they find something different that they think is snow? Spoiler -- this isn't some dark book about disappointments and misunderstanding. It's about SNOW and the joy of waiting and SNOW and staying up late with friends and SNOW and discovery. Any child who has waited, waited, waited for something will share in the anticipation of Squirrel. The illustrations are exquisite. Mostly black, white, gray, as fits late autumn. The only color is in the animals: the reds and browns of the fur of the animals. And when the snow comes? Shades of winter blue. Also good: the story begins and ends on the endpapers. And the energy of the animals! A beautiful, detailed study. Fuse #8 does a much better job than me in explaining just how awesome Meschchenmoser's style is, so check out her review. My library copy of this should be arriving tomorrow...And I'll be able to enjoy it with a bit of snow, but not being slammed like the east coast is right now! Thanks for the heads up!